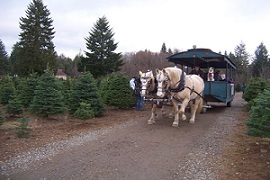 Situated in south central Thurston County, with a scenic view of the Black Hills, Clyde ‘n Dale’s Holiday Trees & Gifts lets you choose your own tree while savoring the joy and tradition of a 10-acre family farm devoted to old fashioned Christmas cheer. Let our horse-drawn trolley take you to your tree. Our gift shop carries local crafts and ornaments, and children delight in our live music shows and entertainment, the jolliest of Santas, and fresh hot free cider to warm their hands and tummies and free coffee available for their parents and grandparents. We stock and groom only the finest lines of fir, including Noble, Fraser, Grand, and Douglas for your holiday pleasure. We also offer lovely, full and beautifully decorated wreaths. Open every Friday, Saturday and Sunday starting November 23 through December 9, 2018, from 9 am – 5 pm. Santa visits on Sundays from 1-3 pm. Gift shop also open on December 15 and 16, 2018. Acres of Trees – Hours of Fun!